I've tried so many times to explain this increase in emails. Since I have some extra time this week I thought I'd take a few pics instead. This increase -- the centered double increase -- was first written about in Starmore's Aran Knitting. She uses it in other arans as well, and you'll see it in many designers' patterns now. Jenna Wilson's Rogue and Jodi Green's Mariah both use this increase. Here's my attempt to explain it. I hope it's helpful to some of you! This next step is the hardest -- but it's really not hard. If you look closely right in between the 2 stitches you just made you'll see a strand of yarn that's going vertical between the two. It's actually the left leg of the stitch you just knit into in the steps above. I've drawn it in red -- click to enlarge and you'll see. Here's the stitch picked up with my cable needle. I promise if you look you'll see it! Now, take that strand and place it on your left hand needle.Knit into the front of the stitch (the way you would normally knit a stitch). You may struggle with this a bit, and you might find it easier to pull on the stitch a bit to stretch it first. Knitting this third stitch should be a little bit difficult though -- that means it will be tight and not form any holes. After knitting it slip the stitch off your left hand needle and you're done! You've made three stitches out of one! The past couple weeks have been great -- busy, lots of family and friends, and some plain ol hanging out and knitting. I hope you all had wonderful holidays. It seems that I'm quite predictable this time of year. Looking back on my postings last December I see I didn't post for two weeks around Christmas last year as well. Guess I'm more of a creature of habit than I'd like to admit. I have had countless copies of Aran Knitting on my watch list on eBay for well over a year. I had set a price ceilling that was quite unreasonable and I knew I'd never actually get a copy -- on my own. I've never actually seen a copy in person. I know I could have gotten a copy from a library, but I sorta enjoyed the waiting. Yup, I've cast on (yet again) for St Brigid. I've actually cast on twice this past week (there's more of that habit again. Christy I know you're laughing right now). I started out with Black Water Abbey yarn in Moss(the bottom one). I love the yarn. The depth of color cannot be beat. But, even knit on US 5 it was still a bigger than what the pattern called for. After a full repeat I admitted to myself that the yarn was just not right (Mary Beth you were SO right!). So I headed down to Rosie's yesterday and found a beautiful shade of Araucania. My mom (not a knitter) says it looks like velvet. The shadings in this batch are quite subtle. The cables are popping beautifully. Araucania is a little lighter weight so I went with US 6s instead of 7s. I'm knitting the larger size and it's coming out somewhere between the two -- just what I was hoping for. Now if you'll excuse me it's time for me to get back to my Christmas knitting. 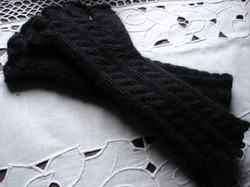 Have you made a pair of Natalya gauntlets? I've decided I'd like to start a readers' gallery. If you have -- and you'd like to be included -- please leave me a comment. As the weather has gotten colder I've been getting some questions and comments from people so I know some of you are working on them again. It's so much fun to see all the different varieties that you all come up with from such a simple pattern! If you're newer to reading my blog (meaning, within the past 8 months or so) you may not even recognize this sweater. It's my oldest UFO. I cast on for this on January 1, 2004 -- almost 2 years ago. I have a history of working on this sweater in fits. I'll pick it up for a few weeks and finish a piece, then leave it be for 10 months. I'm not sure why, it just isn't able to keep my constant attention. On Friday I decided I should finish it for Christmas. All that's left are 2 sleeves, a neckband, and the seaming. The front and back have already been blocked (that explains why the body looks so different from the sleeve I propped on top of it. I'm trying something new and doing 2 sleeves at once. So far I like it. My biggest beef with doing 2 at once is dealing with the extra ends, but I stuck both balls in a ziploc to keep them from rolling around each other and that's made all the difference. Each time I finish a row I give the bag a half-turn and it's completely detangled. You may notice the sleeve has a bit of navy at the bottom of it. That's the way the pattern was written but I wasn't sure I wanted to do it. Now that it's done I'm really glad I did. The Araucania looks so nice with the added color in there at the bottom. 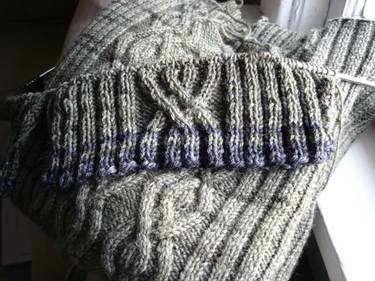 It even got me thinking that striping Araucania for another sweater would be really nice. For now though my focus is on finishing this sweater. End of year is my work's most busy time -- leaving me almost no knitting time during the week. Since I'm not fond of those "I'm here but really busy" posts you'll only see a few more posts from me until the 20th (my last day of work for the year!). I am here though (and I'm fine) -- just busy and trying to tie up all those loose ends so I can take time off without worrying too much about what's going on while I'm off. How's a knitter to say no to that? Add in a little Catholic guilt and we're good to go. The yarn is really nice. It's a bit inelastic but the softness is wonderful. I've only made one mod so far. Instead of doing a two-stitch purl edge on each side, I've opted to do an i-cord edging. Here's a closeup of the WS. I may need to buy more yarn. I bought 5 hanks and I'm almost done with one but it's only 10 inches long. Warm and cuddly usually mean 2 wraps around the neck and plenty left over to cover the opening of the coat. So I think I may be going back to buy 1 or 2 more hanks. A 6 or 7 hank scarf, plus 2 other gifts I'll show you soon. Are you all laughing at me yet?